Nearly 80 percent of the world’s population lives on less than $10 a day. For globally-aware parents who want to give their children a glimpse of majority-world reality, long-term medical missionary to Africa J.A. 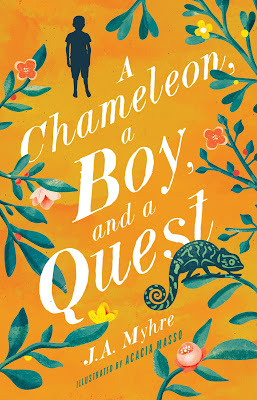 Myhre has penned A Chameleon, a Boy, and a Quest (New Growth Press/October 6, 2015/ISBN: 9781942572084/$15.99). This beautifully-written adventure book for young readers brings to life the African savannah Myhre calls home, inviting readers to explore the country through the eyes of a 10-year-old boy named Mu. Orphaned as a toddler, Mu has served his whole life in his great uncle’s house where he is unloved and ignored. In his drudgery-filled life, Mu has little hope of happiness and doesn’t believe anything will ever change. Then one morning something special happens. Q: You have served as a medical missionary for more than 20 years. How did you make the leap to children’s author? I have always been a writer at heart — letters, journals, blogs. At the time I wrote this book, we were living in a very remote area on the Uganda-Congo border, and I wanted to come up with a Christmas gift for my four kids. They were all avid readers, but I noticed none of their books had any relationship to their world. So I decided to write them a story for Christmas with characters and a setting they could recognize. That became a tradition, so for four years running I wrote them a short novel each year. We would begin reading it aloud on Christmas Eve and continue each night through New Years. Q: Can you share more about the inspiration behind A Chameleon, a Boy, and a Quest? How old were your children when you first wrote this story for them? They were ages 7 to 12 for the first book. I wanted a story in which African characters were the heroes. The setting is basically the same as our village and the surrounding savannah and mountains. My kids often kept chameleons as pets and would walk around with them on their shoulders, and I thought the little reptiles looked wise. Africa does not have such stark divisions between the material and spiritual worlds, between what is seen and what is real, so imbuing animals with communication and painting the background of spiritual forces made sense. We also had a yellow lab that once saved my daughter from a cobra on the path and was a true protector and friend. I often thought a good dog and a guardian angel are very close. I also wanted to draw attention to the lives of our neighbors and friends. Most of the kids who hung out at our house every day had lost one parent, or both, and struggled to stay in school. Our next-door neighbor ended up in a rebel group. This is reality for kids in much of the world. So I wanted a story where kids who live with that kind of challenge had courage and hope, even if they made mistakes. Q: By the title of the book, we can assume a chameleon and a boy are the main characters in the book, but can you tell us a little bit about Mu and his reptilian friend? Mu is being raised as an orphan in the home of his great-uncle, started school late and is bright but has had few opportunities. He is treated as a servant in the home. His situation reflects daily reality for many of the kids who grew up around us. Because this is all he ever remembered, he does not question this situation until he meets Tita, the chameleon. Tita is a messenger that accompanies him throughout his adventures, giving comfort and advice as events in his life spiral out of control. Q: What kind of quest does Tita take Mu on? The nature of the quest is mysterious. Basically, Mu is finding out who he really is as he faces extreme challenges of survival. But his ultimate quest is to save someone else’s life, and I won’t give that away! Q: Of all animals in Africa, why did you choose a chameleon to be the guide of this quest? My kids had chameleons as pets. They are small, concealable and look old and wise. In the economy of the Kingdom of God, the smallest and least likely are often the most important. I don’t think I have ever read a book featuring a chameleon, so that seemed like a gap that needed to be filled! Q: How were you able to tackle some difficult Third World issues, such as orphans, child soldiers, slavery and the Ebola virus, in a way that was honest but not disturbing to young readers? These were the realities my kids and all the kids around us lived with daily. They are issues for our entire world, and it is valid to be disturbed a bit about them. But the book presents them in a hopeful way. Even though Mu is severely affected by many of these evils, he is able to hold on and persevere and come through them, which gives kids an honest but empowering view of the world and themselves. Q: Why do you think it’s important to educate our kids about how the rest of the world lives? I think this question addresses American readers, so let me start there. Short answer: Because that’s the world we all live in. I think our kids are the generation that will grasp justice. They know we are all connected as humans and all responsible to struggle for those who are oppressed. I hope by giving the poor names and stories, kids everywhere will embrace their struggles. However I’d also like to answer that I hope some of the kids who read this book will identify with the characters because they are actually living a story that is not so far from this one. And for those kids, I think literature is empowering because it gives a sense that while evil is part of their story, it is not the end of their story. Q: In what ways is Mu a hero? How will young people be able to identify with him? Mu is an unlikely hero. He does not seek his quest — it finds him, which is often true in our lives. He mainly just keeps moving forward, reacting to events as they unfold. But he does have to make some decisions about who to believe, who to trust, what to risk. I think kids everywhere will identify with the conflict of wanting to trust in friendship even when a less-charitable interpretation of motives and events would be easier and in taking a stand against the pressure of peers to do something wrong. Or, more to the story, NOT standing against that pressure and living with the consequences. Q: There is a strong theme of redemption in the story. Do you think all actions are redeemable? Yes, all actions are redeemable. There is no evil done by humans that is too great for forgiveness, and even terrible suffering and loss can be part of a bigger picture of good, moving toward an “all shall be well and all manner of things shall be well” ending. Q: What character in the book did you most identify with and why? I suppose I am closest to the well-meaning but marginal nurses in the rural hospital scene. They symbolize a place of safety for some kids along their hard journeys, a source of some comfort, food, healing. Q: Many parents would like to see their children trade in their electronic devices for a book at times; however, parents have to be watchful of what fiction they allow their young readers to pick up. What sets A Chameleon, a Boy, and a Quest apart from other books available to this demographic? This book does not gloss over or sugar-coat evil, but neither does it blur evil into an amorphous world view that everything is equally good. The story respects children as valid and essential actors in the story of our world’s redemption. It takes seriously the inevitability of wrong choices and mistakes, but it shows hope. In the end it also affirms the ties of family and community, and as Sam says to Frodo, there is some good in this world worth fighting for. Lastly it’s a page-turning story and uses decent vocabulary and paints a picture of a world many American kids never see. Q: Some research suggests as many 1 million children are orphaned every year in Africa, most of them due to AIDS. It seems like a daunting, untouchable problem, but what are some practical ways Christians in America can help? Get to know organizations that are supporting families on the ground. In most places, extended family is available and committed to caring for their own orphans, but those grandmothers need help to maintain large families of kids. School fees and food are the main concerns for most of these families, so supporting scholarships for education and agricultural projects for food are the best ways to help African families remain intact. Q: A big part of your work in Africa has to do with helping to train indigenous leaders on issues like HIV prevention and nutrition. Why is this key to your work? We try to follow the model of Jesus, who touched and healed the sick, taught people to live in a way that would maximize life and thriving and gathered disciples around him to do the same. So we keep a focus on both curative care for immediate illnesses and big-picture, long-term projects to prevent those illnesses, all the while training others to carry this much further than we can ourselves. Nutrition and HIV prevention are two key areas for holistic change that draw in the entire family and community relationships and impact in key times of life, such as pregnancy, birth, and early childhood. Preventing HIV transmission to a baby and ensuring that baby’s early nutritional status is the difference between life and death or between a stunted and struggling existence due to a malnourished brain and living up to one’s full potential. Q: How did living and serving as a medical missionary among the poor in Africa change your family? Your children? This is the only life we have lived; we moved to Uganda in 1993 with an 8-month-old, and all our children were born and raised overseas. So I can’t say what “changed,” but I can say I am thankful for this life in spite of its difficulties. Our kids have known war and disease firsthand and have dealt with being different and, at times, ostracized. But I think they are amazing people: resilient, kind, loyal. They are aware of what it means to live in extreme poverty. They care about issues like AIDS, orphans, Ebola, rebels, environmental degradation, wildlife preservation, abuse, slavery, early marriage and the entire range of injustice because those issue have names and faces for them — they are not abstract constructs. It is a privilege to have friends from a part of the world that is very isolated, whose appearance and beliefs are very different from your own. They naturally think globally. They also had the privilege of camping in game parks and hiking in the mountains and drinking in the natural beauty of our area of the world. Q: What is your ultimate hope for the young people who read A Chameleon, a Boy, and a Quest? That they would hunger for an encounter with a deeper spiritual reality and see in the story a picture of the love of Jesus for them. And for those who are not from Africa, that they would respect and relate to an African character in a way that makes that continent a real, interesting and valid place, which perhaps sparks them to think about their own quest in life. To learn more about J.A. Myhre and A Chameleon, a Boy, and a Quest, visit www.newgrowthpress.com. Filled with the Holy Ghost I am! All my sins are washed away, I’ve been redeemed. Adventures in Odyssey and Odyssey Adventure Club have you covered. Karen Ehman and Glynnis Whitwer, authors of Everyday Confetti, share ideas and tips for simplifying and taking the stress out of the holidays. Pointing to the real reason for the season, they offer ideas to help you keep Christ at the center. Click here for a free download of their Focus on the Family broadcast where they offer hints on how to simplify and de-stress your holiday season. The Crafty Dad and Daughter set out today for the first of a three day adventure at a Holiday Expo at the Mesquite Rodeo. I'd say more except I am literally falling asleep as I type this post. Since last Sunday after we did last week's show, I've completed 26 items. I've been up way too late working on projects, and I barely slept last night. I almost always have a problem sleeping the night before a show. I think a lot of that has to do with knowing that I HAVE to be up early. Last night around 12:30 AM (ok, that's this morning, but...) I heard it raining and i had flashbacks to listening to the rain when we couldn't get up the highway due to flooding. I was also hot since the weather had warmed up. At any rate, I have to get my shower and to bed so that I can get up at 6:30 on a Saturday morning. UGH. I hope everyone had a very happy Thanksgiving. Mine was very low key, thankfully. Grab your colored pencils because Julie Klassen is hosting a coloring contest! Stop by the contest page to download and print The Painter's Daughter coloring page and channel your inner artist. One master colorist will receive a signed copy of The Painter’s Daughter, two grown-up coloring books (Enchanting English Garden and Live Loved), and a set of 24 Prismacolor colored pencils. Scan and email your entry to Amy Green with the subject line “The Painter’s Daughter Coloring Contest” to enter the first round of judging by December 8. Then stop by Julie's Facebook page beginning December 10 to vote for your favorite (and tell your friends to vote, too)! The winner will be announced at Julie's Facebook event on December 15 at 7 p.m. CST. Ready? Set. Color! Sophie Dupont assists her father in his studio, keeping her own artwork out of sight. In private, she paints the picturesque north Devon coast, popular with artists--including handsome Wesley Overtree, who seems more interested in Sophie than the landscape. Captain Stephen Overtree is accustomed to taking on his brother Wesley's responsibilities. Near the end of his leave, he is sent to find his brother and bring him home. Upon reaching Devonshire, however, Stephen is stunned to learn Wesley has sailed for Italy and left his host's daughter in serious trouble. Stephen feels duty-bound to act, and strangely protective of the young lady, who somehow seems familiar. Wanting to make some recompense for his own past failings as well as his brother's, Stephen proposes to Miss Dupont. He does not offer love, but marriage "in name only" to save her from scandal. If he dies in battle, as he fears, she will at least be a respectable widow. Desperate for a way to escape her predicament, Sophie finds herself torn between her first love and this brooding man she barely knows. Dare she wait for Wesley to return? Or should she elope with the captain and pray she doesn't come to regret it? The Silent Governess, The Girl in the Gatehouse, and The Maid of Fairbourne Hall, have won the Christy Award for Historical Romance. The Secret of Pembrooke Park was honored with the Minnesota Book Award for genre fiction. Julie has also won the Midwest Book Award and Christian Retailing's BEST Award, and has been a finalist in the Romance Writers of America's RITA Awards and ACFW's Carol Awards. Julie and her husband have two sons and live in a suburb of St. Paul, Minnesota. For more information, visit www.julieklassen.com. No matter how young or how old, there’s a part of us all that wishes we could go back and tell ourselves what we should have done differently—which is what James L. Rubart explores in his new book, The Five Times I Met Myself. Brock Matthews’ once promising life is unraveling. His coffee company. His marriage. So when he discovers his vivid dreams—where he encounters his younger self—might let him change his past mistakes, he jumps at the chance. The results are astonishing, but also disturbing. What if you met your twenty-three-year-old self in a dream? What would you say? Brock Matthews’ once promising life is unraveling. His coffee company. His marriage. So when he discovers his vivid dreams—where he encounters his younger self—might let him change his past mistakes, he jumps at the chance. The results are astonishing, but also disturbing. Because getting what Brock wants most in the world will force him to give up the one thing he doesn’t know how to let go . . . and his greatest fear is that it’s already too late. James L. Rubart is a professional marketer and speaker. He is the author of the best-selling novel “Rooms” as well as “Book of Days,” “The Chair,” “Soul’s Gate,” “Memory’s Door,” and “Spirit Bridge.” He lives with his wife and sons in the Pacific Northwest. Find out more about James L. Rubart at http://jameslrubart.com. The search for her runaway sister goes awry when Carrie finds herself arrested during the Civil War for impersonating an officer in Andrea Boeshaar's A Thousand Shall Fall. Soon, though, she finds herself drawn to the handsome, gallant colonel who arrested her. Carrie Ann discovers that her foe has become her ally—and more than that, someone she could love. Will she protect someone who has been like family or be loyal to this stranger to whom she wants to offer her heart? When her world is being torn apart around her, whom should she trust? Andrea is celebrating the release of A Thousand Shall Fall with a Kindle Fire giveaway! Enter today by clicking the icon below. But hurry, the giveaway ends on December 10th. The winner will be announced December 11th on Andrea's blog. Nineteen-year-old Carrie Ann Bell is independent and spirited. The only thing she really fears are the Union soldiers fighting against her Confederate friends. When her youngest sister runs away from home, brave Carrie Ann is determined to find her and bring her back. Disguised as a soldier, she sets off–only to find she’s fallen into the hands of the enemy. Soon, though, she finds herself drawn to the handsome, gallant colonel. He rescued her, protected her, and has been every inch the gentleman. Carrie Ann discovers that her foe has become her ally–and more than that, someone she could love. But the arrival of Joshua in the Union camp as a spy will test her loyalties. Will she protect someone who has been like family or be loyal to this stranger to whom she wants to offer her heart? When her world is being torn apart around her, whom should she trust? Find out more about Andrea at http://www.andreaboeshaar.com. Blaze, Spirit blaze, set our hearts on fire. Lord, and let there be light! 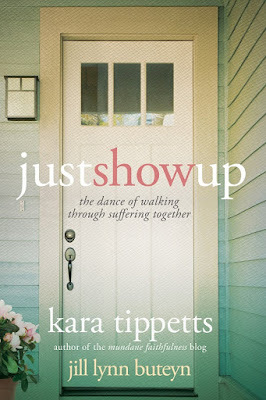 Best-selling author Kara Tippets' story was not a story of disease, although she lost her battle with terminal cancer. It was not a story of saying goodbye, although she was intentional in her time with her husband and four children. Kara's story was one of seeing God in the hard and in the good. It was one of finding grace in the everyday. And it was one of knowing "God with us" through fierce and beautiful friendship. 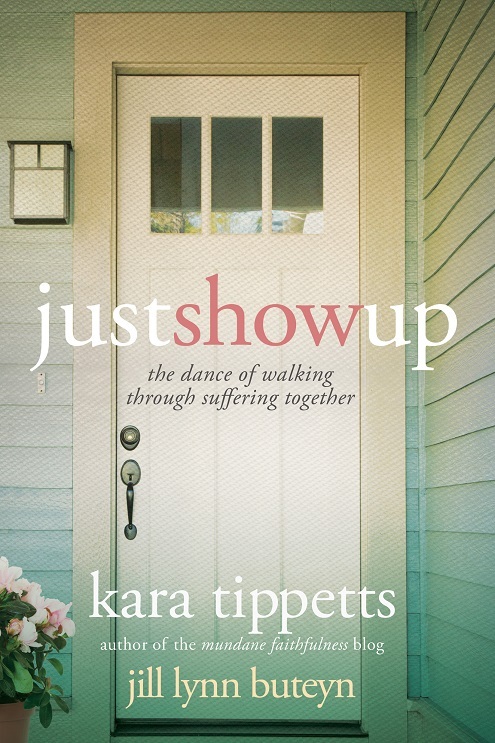 In Just Show Up (David C Cook), Kara and her close friend, Jill Lynn Buteyn, write about what friendship looks like in the midst of changing life seasons, loads of laundry, and even cancer. Whether you are eager to be present to someone going through a difficult time or simply want inspiration for pursuing friends in a new way, this eloquent and practical book explores the gift of silence, the art of receiving, and what it means to just show up. Everyone knows someone with cancer. Or depression. Or a debilitating illness. Often we’re not sure what to do or say around people who are sick or suffering. 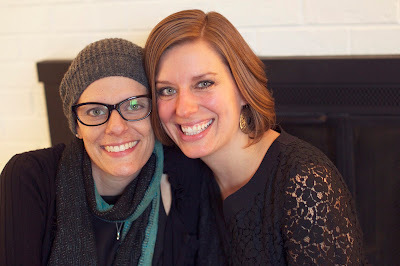 When my friend Kara Tippetts was diagnosed with breast cancer in her mid-thirties, we hadn’t known each other for very long. I didn’t have a clue what to do or how to help her. But I decided I did want to be there for her, even if cancer left me feeling clueless. I learned a lot from watching Kara’s community rally around her while she fought cancer, and around her family after she passed. If you’re in the place I was – that confusing moment of “how do I do this?” – here are a few guidelines for what to do when you don’t know what to do. 1. Choose them. It sounds so simple, but this is the first step we can take in being there for a friend or even acquaintance who’s fighting breast cancer—move toward them. When things are hard or uncomfortable, or maybe we don’t know someone that well, stepping toward them can be scary and leave us feeling vulnerable. But you don’t have to know what you’re doing right away. Just deciding to be there for them is the biggest hurdle to cross. Don’t run away out of fear of doing or saying the wrong thing. Make the decision that you’re in, even if you don’t know exactly what that looks like. 2. Keep it simple. We often complicate things. We think our gestures need to be grand or cross continents, but that isn’t the case. Sometimes it’s the cup of coffee, the hug, the text that says, “I’m thinking of you,” that makes all the difference. Yes, some people will rock at organizing the big fundraiser (and if that’s you, go for it! ), but small, simple things also matter to the heart. 3. Be specific. When you want to help your friend or loved one, be specific in what you offer to do. If you don’t know where to start, think about your gifts. What brings you joy and might also bless your friend during their hardship? Often that tug, that idea already fighting for attention in your mind is exactly where to begin. Instead of saying, “let me know what you need,” say “I’d like to help by doing ______. Does Tuesday work for you?” This makes it easier for a friend to accept help, and when you serve within your gifting, everyone benefits. 4. Be a good listener. When our people are telling us about their hardship, it’s hard not to want to help… and fix. But most of the time, they aren’t asking for this input. Often they just need someone who’s willing to listen and let them vent about what’s going on. Try to listen without letting your mind spin regarding what you want to say next about fixing their suffering. 5. Keep including them. Many times when we know our friend is sick or hurting, we assume that they don’t have the time or energy to be with friends or attend an event. This might be true—maybe they can’t fathom doing one more thing—but we can still give them the choice. Keep inviting them and don’t leave them out. At the same time, we need to be gracious if they need to say no. This is about showing them they are still loved, appreciated and noticed. I’d love to tell you I did all of these things right as a friend surrounding Kara, but I didn’t. I made plenty of mistakes. In fact, sometimes that’s how I learned—by doing it wrong first. Hopefully these tools will give you the confidence to lean toward a friend instead of away, and to enter in to the blessing of doing community together. Jill Lynn Buteyn is the co-author of Just Show Up: the Dance of Walking Through Suffering Together, written with the late Kara Tippetts. Buteyn is also the author of Falling for Texas, an inspirational novel, and a recipient of the ACFW Genesis Award for her fiction work. Buteyn lives near the beautiful Rocky Mountains with her husband and two children. Learn more about Jill Lynn Buteyne and Just Show Up at www.jill-lynn.com and on Facebook (JillLynnAuthor), Pinterest (JillLynnAuthor), Instagram (JillLynnAuthor) and Twitter (@JillLynnAuthor). The Rapunzel fairytale story is reimagined in a new YA novel, The Golden Braid, by Melanie Dickerson. Fiercely devoted to Rapunzel, her mother is suspicious of every man who so much as looks at her daughter and warns her that no man can be trusted. After a young village farmer asks for Rapunzel’s hand in marriage, Mother decides to move them once again—this time, to the large city of Hagenheim. How will Rapunzel finally take control of her own destiny? And who will prove faithful to a lowly peasant girl with no one to turn to? Melanie Dickerson is the author of “The Healer’s Apprentice,” a Christy Award finalist and winner of the National Reader’s Choice Award for Best First Book. Melanie earned a bachelor’s degree in special education from the University of Alabama and has been a teacher and a missionary. She lives with her husband and two daughters in Huntsville, Alabama. Find out more about Melanie at http://www.melaniedickerson.com. Drawing from 33 years of on-air radio ministry, Cynthia Ruchti tells stories of hope-that-glows-in-the-dark through her novels and novellas, nonfiction books and devotionals, and speaking for women’s and writers’ events. Her books have been recognized by Romantic Times Reviewers’ Choice Awards, Selah Awards, the Gayle Wilson Award of Excellence, Christian Retailing’s BEST Awards, and Carol Award nominations, among other honors, including a Family Fiction Readers’ Choice Award. She and her plot-tweaking husband live in Pittsville, Wisconsin, not far from their three children and five grandchildren. In a day when marriage seems incredibly disposable, USA Today best-selling author Rachel Hauck weaves a story rich in symbolism that reminds us of timeless truths about love. Hauck is captivated by the 1940s, and in The Wedding Chapel (Zondervan/ November 17, 2015/ISBN: 978-0310341529/$15.99), she juxtaposes two story lines: one capturing the simple romance and commitment to family embodying the earlier era and another showing the challenges and complications of romance in a modern world. Retired football hall-of-famer Jimmy “Coach” Westbrook never imagined anything would come from the wedding chapel he built, stone by stone, for the beautiful Collette Greer, the woman he fell for back in 1949. He lost her long ago, and for 60 years his labor of love has sat empty, a monument to his memories. Then one day an offer arrives to turn the chapel into what it was meant to be: a place of love and eternal promises. Coach sees no reason to hang onto his dream any longer. Meanwhile photographer Taylor Branson is trying to make a life for herself in New York. She leaves her home in Heart’s Bend, Tennessee, determined to put the broken promises and dreams of the past behind her. Given how divorce tore apart her family, Taylor tends to be more cautious with relationships but surprises even herself when she falls head-over-heels for Jack Forester. Taylor allows her heart to carry her into a whirlwind elopement, but doubts, disagreements and second thoughts enter shortly after they say “I do.” Jack has his own demons to battle and struggles to show Taylor his true self and the depths of his love for her. When Taylor takes an assignment in Heart’s Bend, the job does more than send her back to her hometown. She becomes immersed in a world of long-buried family secrets and finds her journey intersecting with Coach’s in a surprising way. Together they rediscover the heartbeat of their dreams and find it’s never too late to seek love— and it’s worth every single moment of waiting. Rachel Hauck is a USA Today best-selling and award-winning author of critically acclaimed novels such as The Wedding Dress, Love Starts with Elle and Once Upon A Prince. Hauck has a journalism degree from Ohio State University and is a huge Buckeyes football fan. She worked in the corporate software world before she began writing full time in 2004. Hauck serves on the Executive Board for American Christian Fiction Writers and leads worship at their annual conference. She is also a mentor and book therapist at My Book Therapy, a conference speaker and a contributor to Southern Belle View Daily. Hauck lives in central Florida with her husband where she writes from her two-story tower. 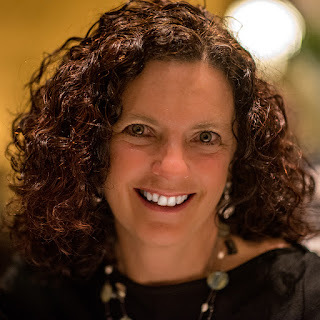 Learn more about Rachel Hauck and her books at www.rachelhauck.com or on Facebook (RachelHauck) and Twitter (@RachelHauck).